From a distance, the traditional Rolex YachtMaster looks like a Submariner, but in reality, it is a much different watch. Initially introduced in 1967 as a derivative of the Rolex Daytona Chronograph, there were only two known versions. The more modern edition of the Yachtmaster was introduced in 1992 in 18kt gold, utilized the same crown and movement as the Rolex Submariner of the day, but because of the caseback, was given a 100m depth rating rather than the Submariner’s depth rating of 300m. Since 1992, the YachtMaster has had a few size and model variations, but by and large, has followed the same design updates as the Submariner. Differentiating the YachtMaster from the rest of the Rolex professional line is the use of platinum and the lug and solid end link design. Designed for top-side of a Yacht rather than the undersea world of SCUBA diving, the Yachtmaster has a high gloss finish and slightly rounded corners. Rather than possessing brushed lugs as the Submariner, the YachtMaster has a high polish finish throughout the case that compliments the platinum rotating bezel. Unlike the all stainless bezel of the Submariner, the YachtMaster is Rolex’s only sport watch with an all platinum bezel. The only notable exception is the all platinum Rolex Day-Date. 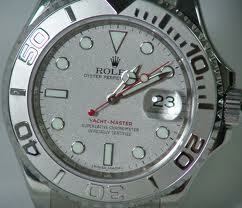 Further differentiating the YachtMaster is the use of platinum on the watch face. Rather than being a contrasting black found on other sport watches, the YachtMaster has a platinum glitter that matches the high polish case and bezel. The only hint of contrast is an all red second hand that is exclusive to the YachtMaster. Lastly, the Rolex YachtMaster bracelet solid end links are raised from the watchcase. There is no documented reason why the solid end links do not match the contour of the case lugs, but there are a distinguishing feature not found on any other Rolex. Some theorize that in the early 1990’s Rolex was looking to update and modernize the venerable Submariner as the Yachtmaster possessed more similarities than differences. The Yachtmaster is the same size as the Submariner, weighs more than the Submariner because of the platinum bezel, and designed to compliment a fiberglass yacht and feel at home in a yachting club clubhouse. Not until 2010 were there technical revisions to the YachtMaster taking the watch back to its chronograph roots, and 2012 that the 1992 version was updated with revised bezel mechanism, clasp, bracelet, and watch face. 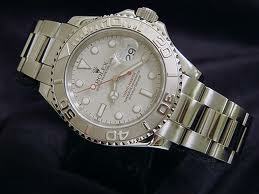 Not clearly a Submariner, the Yachtmaster in a class of its own.